I'm still a beginner myself, but in general, don't ignore the intellectual aspect of the craft if you are a "doer" and don't ignore the physical practice if you are an intellectual. There is lots of both in smithing. If you don't have time to take a class, spend some time learning how to shape a fire correctly for different fuels and different stock sizes. Or learn what different kinds of steal are and what they are good for and what their working characteristics are. 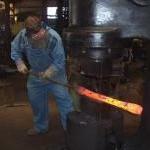 Or learn something about the history of smithing in different cultures. How they solved the same problem in different ways. Any of these will make you a better smith _if_ you apply them to the physical practice as well. Does everyone know what a cold shut is? You nailed it absolutely. Cracks are the root of all failures in metals, be they fatigue or shock/impact caused. A cold shut is a fold in the metal that behaves just like a sharp-bottomed crack, and provides a perfect place for a bigger crack to grow from, usually ending in complete failure just as you're putting the final touches on a piece..
Glenn was kind enough to source shirts with a pocket for my IFI swag as I need a pocket to put my insulin pump in out of the "danger zone". 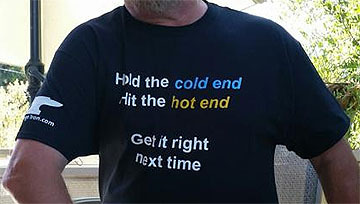 I was very happy to pay for the extra trouble to get shirts I could wear in the shop or when teaching---The "Hold the cold end and Hit the hot end" is my standard shirt for teaching now! Also in only white text.